Delight in contemporary cruising onboard a sleek and elegant Beneteau 50. Added bonus of state-of-the-art water toys to add something extra to your trip! Only 10 passengers so you can enjoy the beauty of the islands in comfort. 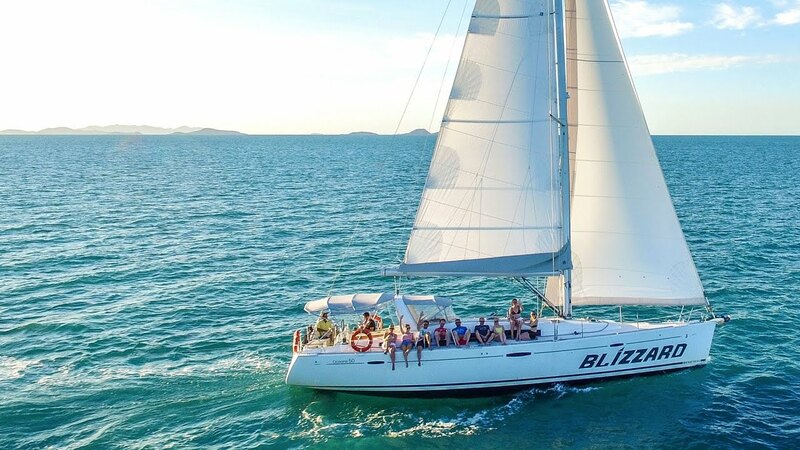 Blizzard offers guests the chance to experience the Whitsundays in style and comfort on their 2 day, 2 night trip. Sail around our beautiful island archipelago, snorkel thriving coral bays and explore the the world-famous Whitsunday Island featuring Whitehaven Beach. Blizzard provides some of the best water toys in the Whitsundays, including a sea scooter, which means you can enjoy the beauty of the islands and marine life in a new and exciting way. Blizzard promises an unforgettable Whitsundays experience with a touch of luxury. Ideal for solo travellers, couples and families alike, this is a fun and interactive tour with traditional sailing and modern comforts. Blizzard is also available for Private Charter. Each tour visits the beautiful Whitehaven Beach on Whitsunday Island. Whitehaven Beach is one of the most famous beaches in the world, known for its stretches of silica sands, warm, calm waters and stunning views of the surrounding islands and sea. A short bushwalk through the national park on Whitsunday Islands takes you to the Hill Inlet Lookout, where you will have a breathtaking view over Whitehaven Beach and the famous and unique swirling sands of Hill Inlet. Be sure to bring your camera along to capture your unique view of the ever-changing swirling sands! Blizzard stops in several of the dreamy Whitsunday Bays for snorkelling, where you will get to explore a whole new world, full of colourful corals and fish. Your crew will prepare you for your adventure into the diverse reefs below, supplying your gear and letting you know what to look out for in each reef! Home to thousands of species of fish and other wildlife, each snorkel will provide a new adventure and amazing underwater experience. Blizzard features the ultimate water toys - the sea scooter and "Supzilla"! The seascooter will take you on the ride of your life as you zoom through the ocean! Use this great addition to make the most of your snorkelling time, allowing it to guide you around the reefs. "Supzilla" is a giant stand-up paddleboard, taking up to 4 people at any one time. With Supzilla you can either relax as you float across the ocean or you can get active and explore new places. Your crew will make all the best choices on where to go, making sure you get to see the best parts of the Whitsundays during your trip. Consider them the experts of the area, knowing all the best snorkel sites, anchorages and the hidden gems of the islands. Take in the incredible scenery as you smoothly sail from one great destination to the next. Feel free to join in all the action of sailing, or simply enjoy the pleasure of ultimate relaxation. *Itinerary is a sample only. Changes may occur based on factors outside of our control (including weather, wind and tide) as well as your captains professional judgement. Shared single accommodation: Single bed in a two bunk cabin (cabin is shared with 1 other person). Private twin cabin: Two single beds in a private space, but sharing bathroom with others. Private double cabin: One double bed in a private space, but sharing bathroom with others. Private double cabin with ensuite: One double bed in a private space with an en suite bathroom. To view the sample menu for Blizzard please click here. Please bring only a small soft bag with: change of clothes, hat, swim-wear, beach towel, sunscreen 30+, warm pullover for the evenings (seasonal). You will only need flip flops or sandals. You will also need to bring your own alcoholic beverages, available for purchase in town. No glass bottles please. Luggage storage is available for $5 per person at check-in (ABC Travel). BYO alcohol - no glass. Soft drinks, bottled water and snacks are available for purchase on board. Minimum age for children is 10 years and over and any guests under 18 must be able to swim. Guests under 18 cannot be booked into shared accommodation, except where group will occupy an entire shared area. In other cases the parent need to occupy the shared area and child share private cabin with other parent. This sailing adventures is only suitable for active people. A basic level of fitness and mobility is required, as a guideline Guests should be able to climb a ladder easily. All departures and itineraries are subject to weather. Tours may be changed or cancelled for any reason at the discretion of the Tour Operator It should be noted that adventure travel involves risk. Whilst we make every effort to safeguard clients, we cannot be responsible for personal injury or loss due to actions of our clients which are beyond our control. We recommend that all clients have travel insurance covering illness, injury, loss or damage to personal belongings and not being able to travel on the confirmed date of departure. Please be aware operators pass on credit card merchant fees so there is a non-refundable 2.5% surcharge for VISA and MASTERCARD card purchases. All client cancellations forfeit 25% of total ticket price. Cancellations made 14 to 30 days before departure will result in a loss of 75% of ticket price. Cancellations made less than 14 days of departure will result in a forfeit of full trip fees. If the sailing company has to cancel the trip (prior to the boat's departure) and we cannot offer a suitable alternative, then a refund will be given minus card fees. We strongly recommend that you have travel insurance, especially during the wet season. "Went on Blizzard for a 3D/2N trip around the Whitsundays. Blizzard is a lovely yacht and has enough space for everyone on board (it is a yacht not a house). Our skipper Scottie was very knowledgeable and made the trip more personal... we stopped to view whales at every opportunity, which all the guests loved. He also took us under sail more than motor, which was great. Des was our deckie and the food was amazing! We felt constantly fed and my girlfriend was well catered for, even as a veggie; had separate meals prepared. Our crew were really good and definitely added to the great experience. Being early in the whale season we did not expect to see any. We were fortunate enough to see multiple breaches and one whale come within 50m of the boat. We snorkelled with turtles and saw some great sections of reef.. you read so many horror stories of the Great Barrier Reef so it was great to see that it is still thriving (if you are willing to not go to the tourist sites that are visited daily by hundreds of people!) The Whitsundays are truly incredible and we felt this was the best way we could have seen them. We will definitely be back and have been inspired to start sailing more! Thank you for a great time." "Amazing trip on the sailboat Blizzard! Scotty and Mitch are just a perfect crew, we couldn't get any better. Scotty, our funny and experienced captain took us to just amazing places. We saw colourful corals, fishes and turtles. Mitch is a great cook! He always prepared delicious meals and helped with everything! Both of them had always an instructive answer for marine life and sailing. It was a beautiful sailing adventure with a very nice group. Thanks for everything!" "We have booked a 2 night sailing tour on the Blizzard, a 50 ft Beneteau sailing boat, and it was a wonderful trip although the weather could have been better. Scotty, the skipper and Desiree, the assistent and cook, did a great job and knew what to do. Everything was well organized, food very nice and the boat quite clean. Scotty likes to sail really and not only use the engine and he is very experienced concerning the Whitsunday waters. Nice stops for snorkeling, clear instructions and entertaining stories made it all very enjoyable. We can really recommend this crew and company." "My friend and I were on board Blizzard from Friday to Sunday - honestly, one of the best experiences of our lives. The snorkelling and scenery, complemented by the monohull sailing, was just so so much more than we could have hoped for. Scotty was a phenomenal skipper with his knowledge of all things, not just the sailing. He is a huge asset to your company. As is Monique, the deckhand, who was the best tour guide we could have hoped for, looked after us, and cooked up a storm every mealtime. In all, thank you so so much for giving us an amazing time." "Best 2 day 2 night trip in the Whitsundays!! It's my 3rd trip out to the reefs and I will say the skipper loccy made the trip with his knowledge and enthusiasm! The food was fantastic and I thoroughly appreciated the effort the skipper went to take us to the best spots on the reefs for snorkeling!! Out of all the boats this is the one to get on !!" "Fabulous trip in great hands. Grateful to have had them take such good care of us. Thanks." "Just finished a fantastic 3 day trip on Blizzard with Scotty & Mitch. The sailing was brilliant and a lot of fun. Both Scotty & Mitch were extremely knowledgeable & informative; they added so much to the experience. The snorkelling was very enjoyable & Scottyâ€™s local knowledge certainly enhanced the trip to Whitehaven Beach. The food was also excellent, plenty of it & good quality. This is my 3rd trip to Aus & Iâ€™ve been on a number of trips & experiences across the country. This is by far the highlight of my previous trips combined! Iâ€™d certainly recommend Blizzard to anyone as you get the true sailing experience with an excellent crew." "It was the best trip while being in Australia!" "Scotty was so knowledgable about all aspects of sailing and the reef and we learnt so much from him in such a short space of time. It's clear he is incredibly skilled and passionate about his job which makes the experience so positive for everyone. Luke was also an excellent deckhand - he prepared delicious meals for us and ensured we never wanted for anything. He was also so friendly and seemed very keen to learn as much as possible from Scott. Thanks very much to both members of the team - it wouldn't have been the same without either of them!" "One of the best experiences I had. The crew was extremely nice, kind and they just make you feel at home." "My personal highlight from 9 months in Australia is definitely the trip we just had on Blizzard, captained by Scotty and Yas his 1st mate. Great weather helped made the whole experience really enjoyable. Scotty's knowledge and experience is second to none and Yas was always really friendly as well as a great cook. Despite cyclone Debbie wiping out the islands only 6 weeks ago, they still managed to show off the best the islands have to offer." "I did a lot of research on different boats/boat companies before booking; we wanted a good value for money boat with a small number of passengers. We chose 'Blizzard' as it had excellent reviews and met our requirements. The whole trip was a once in a lifetime, amazing experience." "We just finished our tour on the Blizzard and wanted to give some immediate feedback. We had a wonderful time and cannot say enough good things about the tour. We really wanted to contact you directly though to emphasize how much we appreciated Mitch! He was unbelievable, especially given that it was his first trip on this boat. He worked extremely hard, was very social, and an all around pleasure to have as our first mate! We hope that many others have the chance to sail with him in the future! Thanks again." 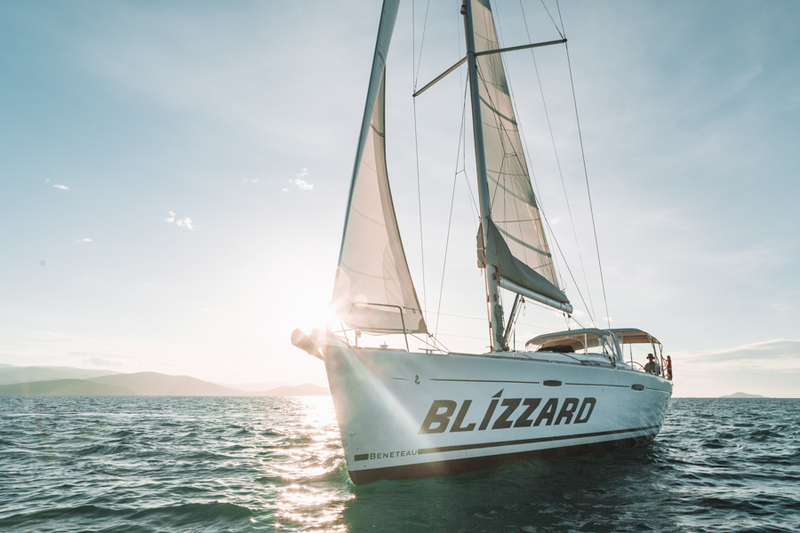 "We choose Blizzard because we knew is was one of newest boats sailing in the Whitsundays. We were very happy with our choice and Blizzard exceeded our expectations. The experienced crew with Ellen and John looked after us for three days and the food always seemed to be brought out whenever we were hungry and there was plenty of it. During our tour we were lucky enough to see whales, turtles even a few dolphins. 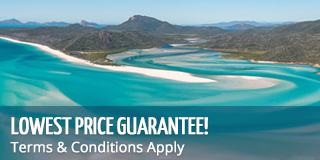 We are more than happy to recommend Blizzard to anyone planing on sailing in the Whitsundays!" "Our 2 day/2 night trip on Blizzard was the highlight of my holiday in Australia. Our captain was so knowledgeable about the Great Barrier Reef and took us to the best snorkelling spots. Our deckhand was so friendly and welcoming and cooked us some lovely simple food, which was just what we needed after a day snorkelling and sailing. I would recommend this trip to everyone!" "We recently sailed onboard Blizzard. Right from the start we could not have asked for better hosts or a more amazing experience! It far exceeded our expectations! Both of the crews knowledge and expertise, combined with their friendly and welcoming attitudes made everyone feel safe, and ensured that we had a fantastic time! We booked the private cabin with the ensuite which was perfect. The facilities on board (not just our room) were extremely clean and looked brand new! Our bed was really comfy and we had amazing views straight out of our cabin! All the meals we had onboard Blizzard were absolutely delicious! We were very impressed, it was so good to know that we would be getting a great feed after doing all our activities during the day! All the experiences we had during our time left us wanting more! We will definitely be coming back and telling all our friends about our amazing trip and the experiences we had - Thanks so much! Cant wait to come back again! " "My friend and I booked Blizzard and we had a blast. Captain Scotty was extremely knowledgeable and made us feel comfortable and at home. Blizzard is in fantastic shape and the cabins are clean and comfortable. The boat sails beautifully, so even the most experienced sailors wont be disappointed. Book this trip - you wont be disappointed!" "The trips was awesome! It was THE highlight of my holiday in Australia thanks to skipper Dave and Stephanie. They are the best! Definitely recommend this to other people. Dave and Steph made the trip an awesome trip!! Very professional, experienced, clean, caring, just great!" "Amazing!!!! The crew were outstanding - the best couple of days I've had in Australia. Thanks so much :)"
"We couldn't recommend this trip and this boat highly enough. If you are looking for a fun relaxed trip-not a party boat but a very sociable boat-that when the wind is good makes you feel like you are really sailing-stop looking for anything else-book an adventure with isail-and if you can-book Blizzard"
"The best way to see the whitsundays is on a yacht & this is the creme de la creme! Stunning boat, great skipper & the lovely Lauren crewing. No more than 10 guests. Can't recommend it enough"
"Hi Lizzie Just updating you on our weekend trip out on Blizzard. We had a marvelous time and the weather was great. We did all the activities, saw wonderful scenes and snorkelling with the fish and turtles was terrific. And we had a wonderful group of people with us. Lots of fun. Thanks for all your help. Cheers Elaine "
"Thanks to Kirsten and Mr Travel for booking Sue and myself On Blizzard, yes it was brand new as you told us, it was. We had a truly fabulous time. Great food, some new friends, and the Whitsundays are really are a sailors playground. thanks to all for a great holiday we will definately be back next year. The Johnsons from Melbourne."